From 1951 till 1989 the Feed Materials Production Center at Fernald, near Ross Ohio, processed low-level uranium for use in nuclear bombs. Fernald is one of 2 former nuclear sites that have been decontaminated to the point where the public can visit. The other is Weldon Spring, a former Army facility 30 miles west of St. Louis. Both are part of the Department of Energy’s Legacy Management Program, which is in charge of the long-term management of sites that have been cleaned up. Fernald covers 1,050 acres, with over 320 acres being grassland. With the addition of 7 miles of hiking trails you can see why this place is a great place to go birding. 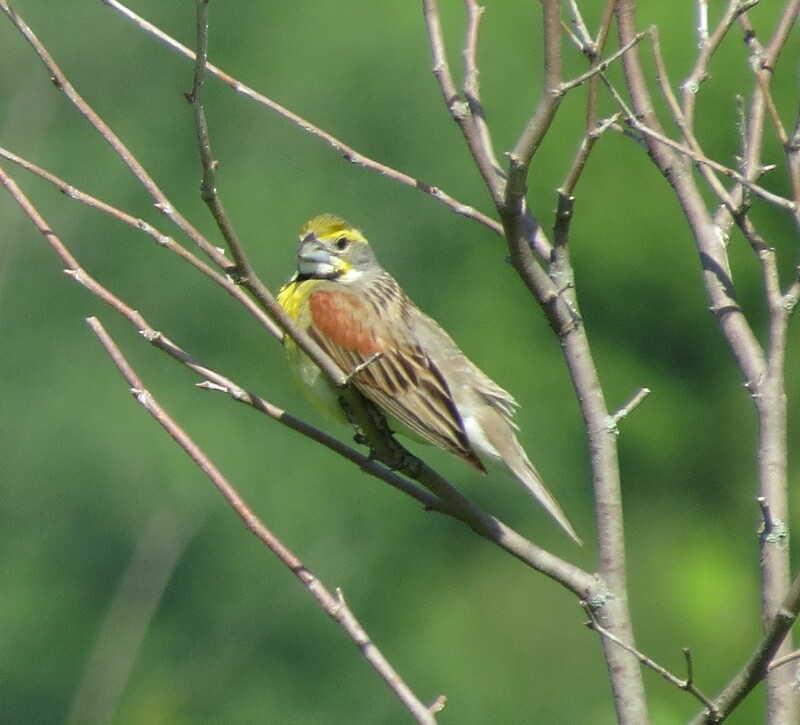 And one of my favorite grassland birds that frequents Fernald this time of year is the Dickcissel. And considering Fernalds past I don’t see in the foreseeable future any developments or soccer fields stripping this wonderful habitat. It’s been hot in the Ohio Valley this week. Temps are reaching into the 90’s and the humidity has tipped that really uncomfortable level. So I headed out in the morning trying to see my target bird for the day before I started to melt. 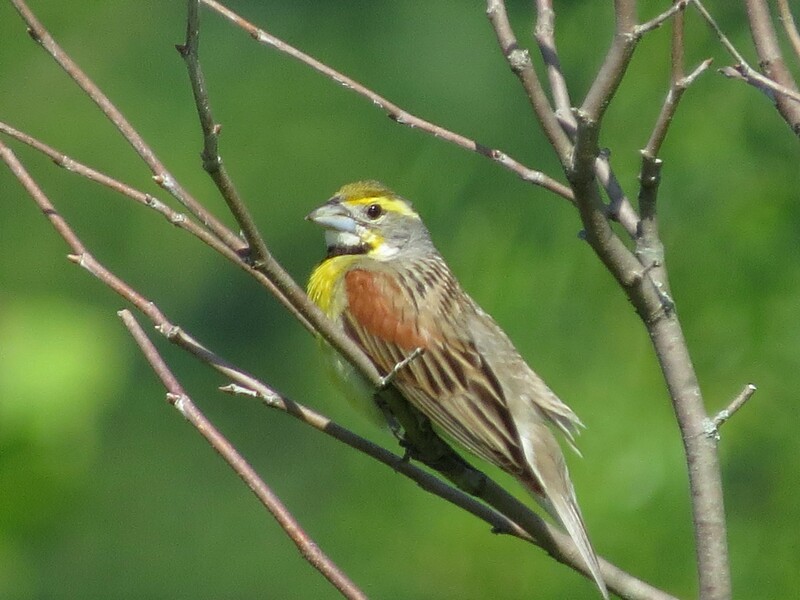 I wasn’t too log after arriving when I heard my first Dickcissel. This is how you’d normally see them. Perched atop of a small tree or bush with their head thrown back singing. 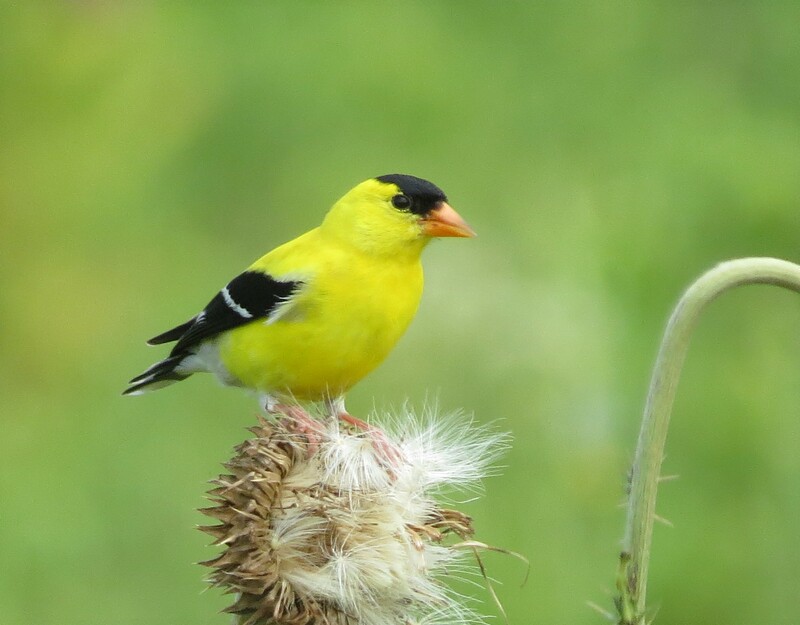 Eastern Goldfinch’s are a dime-a-dozen at Fernald, however I thought this photo was particularly good. 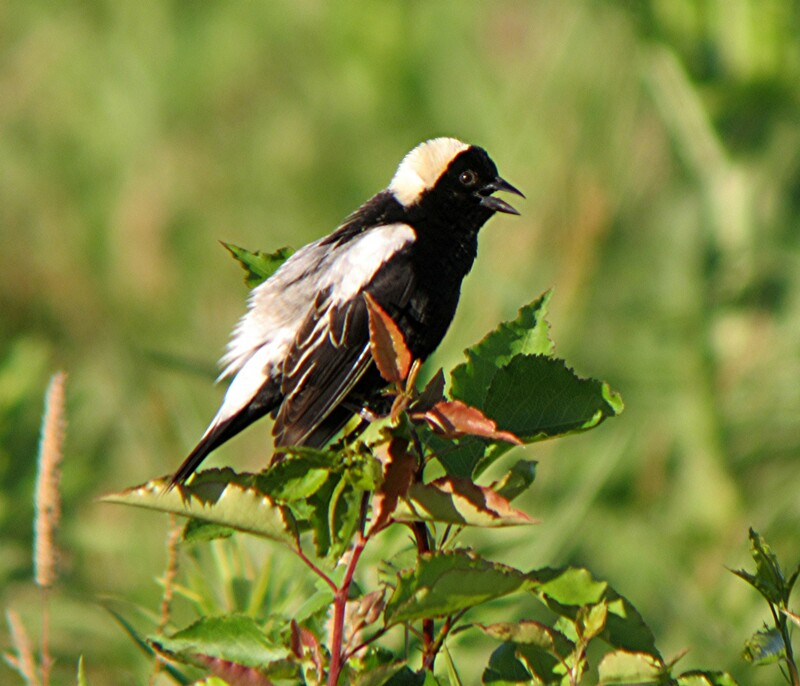 Farewell Bobolinks…I hardly knew you. I’ve been a birdwatcher for a very long time, but it wasn’t till several years ago that I jumped into this wonderful obsession whole heartily. 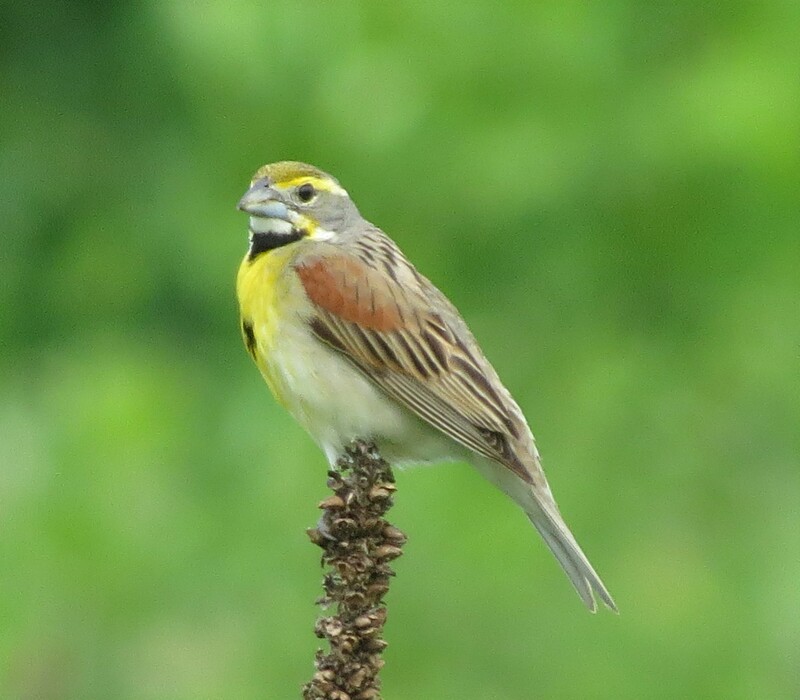 And it was about this time I sighted my lifer Bobolink at a local park over in Butler County Ohio called Voice of America Park. And today it’s a sad reminder of habitat lost and the disappearance of a once plentiful species. In 1942 the United States Government purchased over 430 acres in southwestern Butler County as the sight to build the Voice of America Bethany Relay Station. This sight was to be used as a backup, inland facility in case Germany would attack the east coast locations in Massachusetts, Long Island, and New Jersey. The Office of War Information began broadcasting in July of 1944, which prompted Adolf Hitler to reply those “Cincinnati Liars”. This place was massive and transmitted American radio programs all over the world during the war using 200,000-watt transmitters. After the war it became part of the newly created United States Information Agency in 1953. At it’s peak they had 3 transmitters broadcasting with 250kW, 3 broadcasting with 175 kW, and 2 broadcasting at 50kW. As a young kid my parents would drive by and me awe-struck by the sheer size of all the antennas and towers. And as all things change,technology was the deciding factor in closing the Bethany Relay Station in November of 1994. And all the remaining radio towers were finally taken down in February of 1998. Other than a small piece of land used for a branch facility for Miami University and a museum that tells the story of the Bethany Relay Station, the remainder of the land has been taken over by Butler County Metroparks. Fast forward a dozen years to June 2010. I was just beginning to get the “Twitch” as reports of bird sightings made their way onto social media, and state and local Listservs. With my new found freedom to chase new birds as a full time birder I was ready to take off at a moments notice to “tick” off any new life birds. And that’s what happened this one evening in June of 2010 as I closed out of my web browser and gathered my gear to add a Bobolink to my life list. Having never actually been to the park before I drove off more worried about sighting the bird than how to get there. I had a general sense of location, and as I got close I turned down a street that I thought the entrance was on. That’s when I had my first gruesome encounter with a Bobolink as it lay dead in the road. Probably hit by a car. I pulled over, got out of the car and walked back to pick it up and lay it in the grass by the side of the road. However my spirits were lifted as I noticed more live ones on the other side of the fence. Finally after making my way into the park and finding where to go to locate them, it was an amazing sight. I eventually discovered that they’ve breed here for years and that Voice of America Park is the “Go-To” place to see Bobolinks in the area. And it wasn’t just Bobolinks, Henslow Sparrows were frequenting the park, as on one occasion I counted 8 individuals. And as the years wore on, demand for more and more sports fields as neighborhoods expanded with new homes. So overnight more of the grassy meadows where the Bobolinks and Henslow’s used to breed were now replaced by soccer fields. Now it’s a fraction of what it used to be. The park board has put up a sign stating that it’s an “Important Birding Area”, but it’s too late. 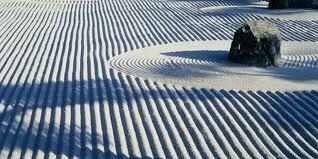 I was there this last Sunday. I tucked my pants into my socks, sprayed on Deep Woods Off, and forged ahead onto the mowed paths they have through the meadows. In all the time I was there I never sighted one Bobolink. 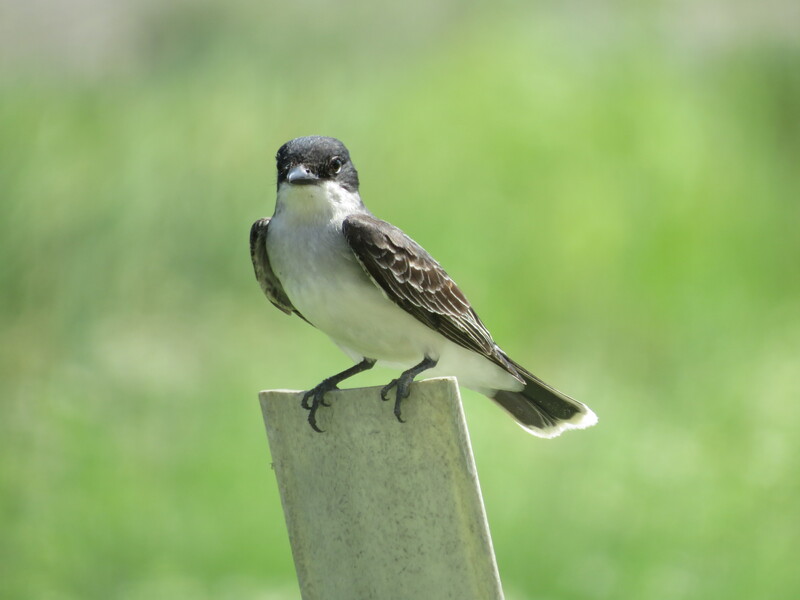 What we have now are the more aggressive Red-winged Blackbirds and Tree Swallows. It was one of the saddest days of birding I’ve ever had because I remember how it used to be. I remember the evening when I picked up my best friend Phil and I helped him get his lifer Henslow Sparrow. I remember you didn’t even need to get of your car to spot Bobolinks. 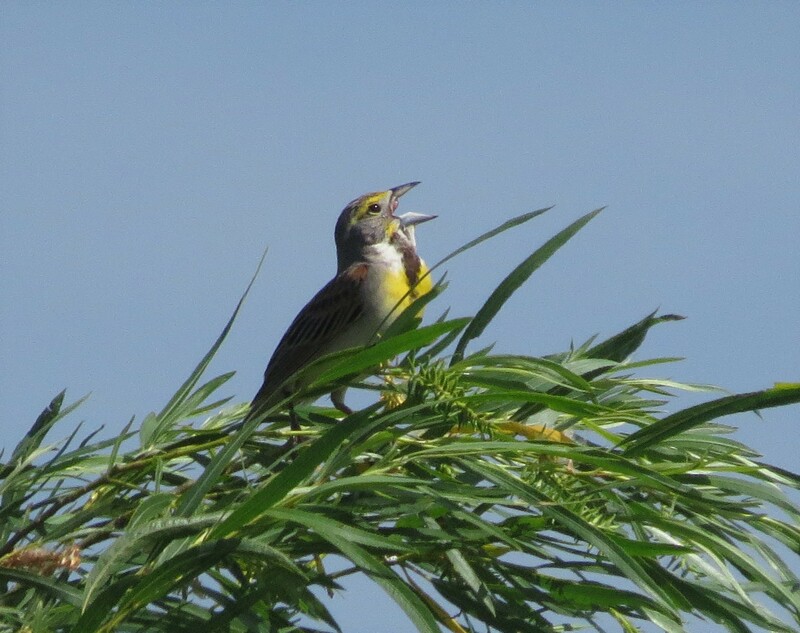 I remember Bobolinks perched on the tops of the small trees singing that bubbly song they sing. They’d flush from the path as you walked along. And they’d pose for us budding photographers. Has this scenario ever happened to you. You were a little negligent in getting your hummingbird feeders cleaned, filled, and hung up outside after a long winter? Were the hummingbirds looking at you through your front window with pitiful looks on their little faces? Or in the case with my own hummingbirds, they would hover in the exact location where I’ve hung my feeders for the past several years. One in my front yard tree, another from the eaves of my front porch, and one more hanging from a shepherds hook in my perennial garden, also in my front yard. So my question is, do they remember where feeders were hung from previous years? And if they were the same pair of hummingbirds that would make sense, however how would one find out if they were the same pair. And if they are different birds how would they know that hummingbird feeders were hanging there at one time? I would watch (feeling quite guilty by the way) as they hovered either under the tree, or under the eaves looking for my feeders. I never noticed this behavior before since I normally get my feeders up in the early part of April, which is just about right for their arrival in my part of Ohio. It’s usually a male and female who claim my yard as their own, plus the romantic in me want to think it’s the same pair I’ve had for several years. Which would explain why they were looking for their feeders. I felt like a bad owner of a pet dog or cat. But now their happy, chasing each other around the yard and posing for some photo-ops. 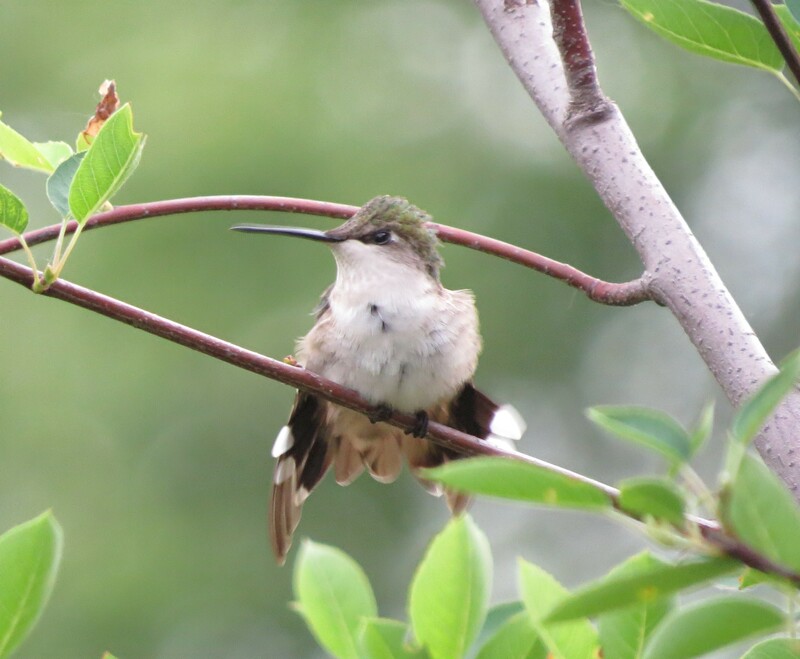 From her perch in our Serviceberry Tree.